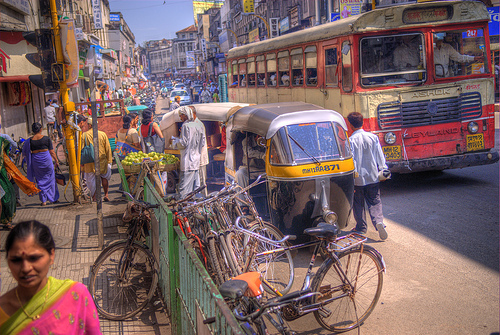 The traffic on the streets of Pune is busy with rickshaws, bicycles, buses and pedestrians. Flickr photo by wili_hybrid. In India, 105,725 people were killed and 452,922 people were injured in road traffic crashes in 2006, and the fatalities can be expected to grow to 260,000 in 2030, unless new policies are implemented, according to a study by Mohan, Tsimhoni, Sivak and Flannigan on road safety in India. The report, “Road Safety in India: Challenges and Opportunities,” was recently released (January 2009) by the University of Michigan’s Transportation Research Institute. The report also reveals that pedestrians, bicyclists and other non-motorized users are the worst affected, and account for up to 60% of the fatalities in urban areas. (In Mumbai and Delhi, pedestrians, bicyclists, and motorized two-wheeler riders accounted for 80% to 90% of all traffic deaths). In a country where the vast majority of the population cannot afford to buy cars (India has 7 vehicles per 100 people) the death rate of 9.5 deaths per 100,000 is shocking compared to first world countries like Sweden, who have more than seven times more cars per 100 people, but less than half the number of deaths. According to the report, factors influencing the high death toll include vehicles going the wrong way on divided highways, and vehicles traveling at mixed speeds varying from less than 50 kilometers per hour to more than 80 kilometers per hour in the same road space, which they also share with bicyclists and pedestrians, and other forms of non-motorized transport, like the occasional bullock cart! Nighttime driving is also substantially riskier – the lack of visibility for road users, drivers under the influence of alcohol, and fatigue make for more accidents. The report points out that India has five times more motorcycles than cars, and the number of cars is equal to the number of trucks, buses, vans, and other non-two-wheeler vehicles put together. Despite this, there is a high involvement of trucks in highway accidents – as high as bikes. Trucks and buses are also involved in more than 40% of fatalities in urban areas compared to 14% in the US. The average fatality rate for million-plus cities is 45% higher in India than in the U.S., and if things don’t change, the report predicts that the death rate per million people in Indian cities will double in just 12 years. Many policy makers blame increasing vehicle ownership for increased fatality rates but this can be avoided if adequate safety measures are implemented. The report recommends that India’s policies should focus on pedestrian and bicycle separation from motor vehicles, speed control on main arterial roads, and traffic calming on all other roads. Measures like pedestrian detection technology, more pedestrian friendly front ends of vehicles, and collision warning systems would all help. Even simple things like improved lighting on roads, enforcing seatbelt and helmet laws and more regular alcohol tests or a “zero tolerance” policy would go a long way to reduce accidents and traffic-related deaths. Download the complete report from the University of Michigan library here.